In this article, I would like to discuss about evaluation of LPC824 low cost 32-bit ARM Cortex-M0 microcontroller using OM13071 LPCXpresso824-MAX Development board. LPC824M201JHI33 is used in the board. Its size is only 5 x 5 x 0.85 mm in HVQFN package. In order to evaluate it, MCUXpresso Integrated Development Environment (IDE) is downloaded and installed. Other tools for it can be found at this link . 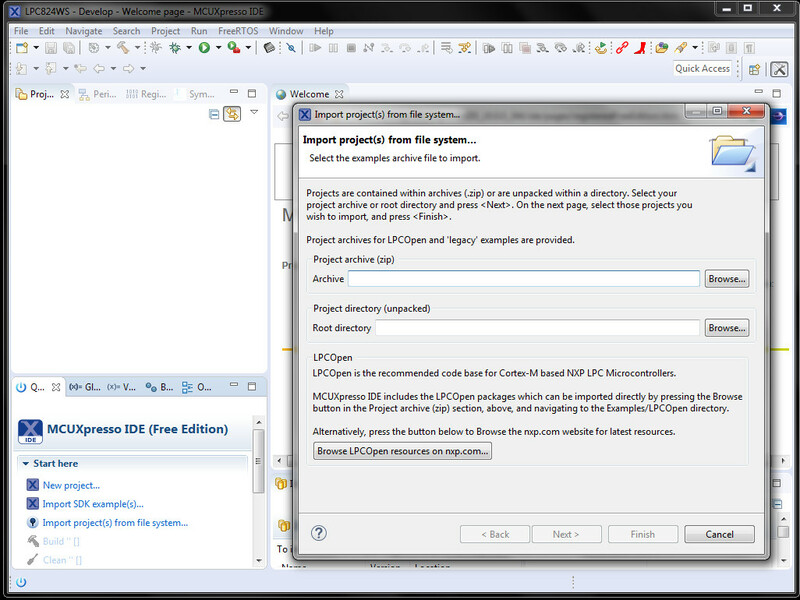 After launching MCUXpresso and assigning a workspace folder, example projects can be imported by clicking Quick Start Panel (near bottom left corner) -> Import projects from file system ... -> Browse LPC open resources as shown in the following figure.